Published in 1767 by Crepy, Rue St Jacques à S. Pierre, Paris. 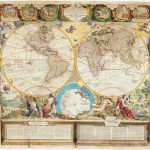 A spectacular four-sheet map of the world, presented as a pair of hemispheres held aloft by allegorical figures of the Four Seasons. The added borders containing vignette scenes from the Old Testament, including the expulsion of Adam and Eve from Paradise, Cain and Abel, Noah’s Ark and the Ten Commandments. According to a small text the decorations were drawn and engraved by Bocquet from Nolin’s ideas. The map, published only a couple of years before Captain Cook’s first voyage, still shows only a partial outline of New Zealand and an unbroken Australian coastline joining Tasmania to New Guinea. In North America the ‘Strait of Anian’ forms a North West Passage from Hudson’s Bay, and the St Lawrence River continues west from Lake Superior. 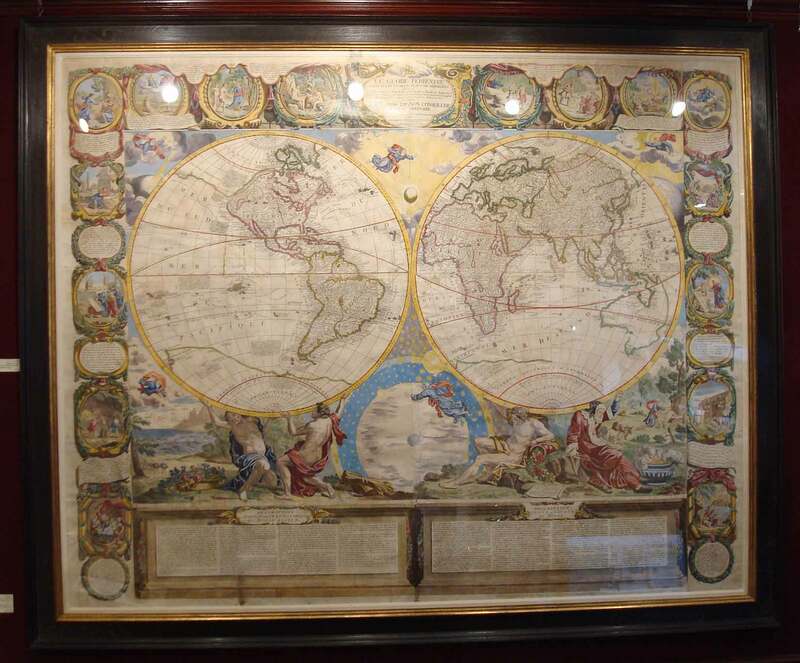 First published in 1700, maps of this style were intended for the offices and homes of important merchants, officials and dignitaries. As new territories were discovered by explorers subsequent editions were altered to publish the latest discoveries. Owing to the vulnerability of such wall decoration very few such maps now come onto the market. This map, although with evidence of paper cracking, some parts with paper re-inforcement, is nevertheless a striking example of the most impressive combination of cartography and art. 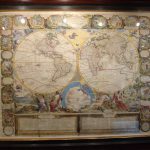 Jean Baptiste Nolin (1657 – 1725) was a French cartographer and publisher active in Paris during the late 17th and early 18th centuries. A man of exceptional business acumen, in an era during which many cartographers struggled financially, he prospered. 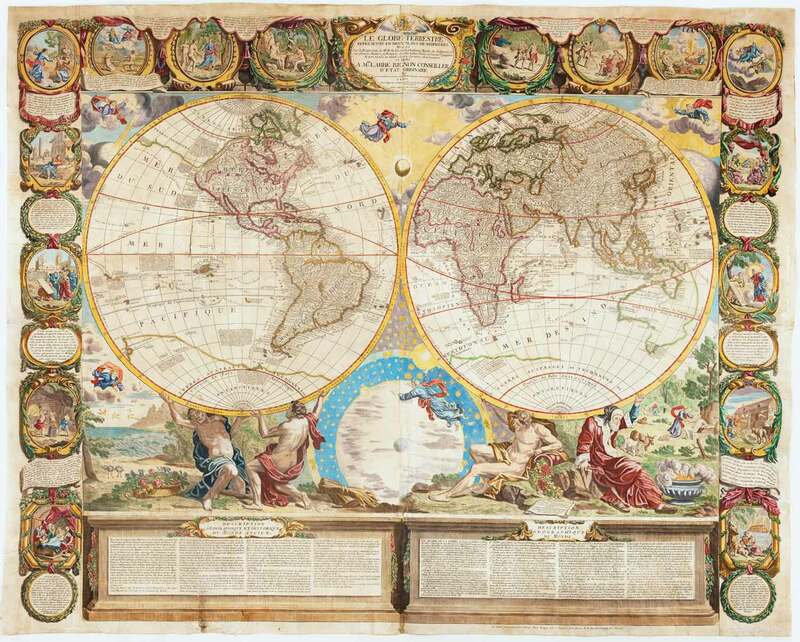 Nolin’s son, also Jean Baptiste Nolin (1686 – 1762) followed in his father’s profession and, having inherited many plates, republished many of his maps well into the 18th century. Both Nolins maintained offices on Rue St. Jacques, Paris.